Here you will find our top-quality, fully serviced and refurbished, Blaupunkt auto radios of the period 1974 – 1980. The Blaupunkt auto radios of this period will fit all European cars of the period featuring the standard 1-DIN radio dashboard aperture (industry standard from around 1974). 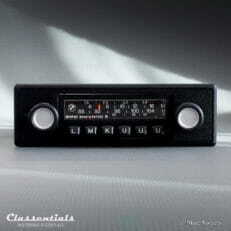 All our radios come ready to install to your classic car and they come with 18 months (1.5 years) warranty. Nearly all these Blaupunkt radios are MP3 ready. With our mono and stereo De Luxe MP3 kits you can play music or stream digital radio channels from play-back devices and your smart-phone featuring a 3.5 mm jack-plug socket. The first stereo auto radio was introduced by Blaupunkt in 1969. High-end Blaupunkt auto radios in excellent and complete original condition are hard to find. The Blaupunkt Münster stereo, the high-end Frankfurt stereo and the top-end Köln stereo are very rare auto radios which are seldomly for sale.